Artaxerxes, the great king, king of kings, king of lands, son of Xerxes the king, the Achaemenid, in whose house this silver drinking cup was made. Greeks - not much help any more. Herodotus' history ends soon after the Battle of Mykale in 479 BC. Thucydides the Athenian wrote about the war between Athens and Sparta (Peloponnesian War: 431 - 404 BC), but is sketchy about events in the 50 years between leading up to it. Diodorus is like us - no reliable narrative to use for this period. What happened during those 40 odd years? On the death of Darius, Xerxes his son took the kingdom; who, as he inherited his father's kingdom, so did he inherit his piety towards god, and honour him; for he did all things suitably to his father in relation to divine worship, and he was exceedingly friendly towards the Jews. According to the Jewish historian Josephus [above] Xerxes continued the friendly policy of his father and grandfather towards the Jews, now re-established in Judaea. According to the Jewish Bible (Books of Ezra and Nehemiah) Artaxerxes continued the policy begun by Cyrus and continued by Darius. This was to help Jews transported to Babylonia to return to Judaea, and give them financial support to rebuild their temple and defences in Jerusalem. There had been opposition to this project from local enemies; Artaxerxes intervened to strengthen the position of the Jews, on condition that they they stayed loyal to Persia. Because Ezra, the Jewish leader and law-giver, decided to accept the authority of Persia, the Jewish nation and its religion was able to reestablish itself in Judaea. The Book of Esther in the Jewish Bible may refer to the reign of Artaxerxes I (although "Ahasuerus" is also identified with Xerxes and Artaxerxes II). Dismissed by some as "historical fiction" it tells the tale of an orphaned Jewish girl, Esther, who's chosen By Ahasuerus to replace his prudish and disobedient wife. She risks her life to reveal a plot by Haman, the king's vizier, to exterminate all the Jews in Persia. Haman is hanged and licence given to Jews to kill anyone they regard as a threat - over 75,000 were slaughtered. The event in celebrated in the Jewish festival of Purim. Greece. Athens was weakened by the Egyptian fiasco. Artaxerxes, using cash incentives, encouraged Persian supporters ("Medizers") in various cities. A formal peace treaty was concluded ("The Peace of Callias" 449 BC). The Greeks believed this was a sign they'd finally won the war with Persia, but in fact it gave the Persians all they needed - guaranteed access to their possessions in Cyprus and Egypt. From 431 BC and throughout the reign of Darius II the whole of Greece was involved in the war between Athens and Sparta and their allies - known as the Peloponnesian War. Was Artaxerxes a good ruler? "Show mercy to those who submit to our rule, but make total war on those who challenge it." Artaxerxes I died in 425 BC, and was succeeded by his son Xerxes II. NEXT: A VERY SHORT REIGN. Rebellions crushed in Bactria and Egypt, and a new policy towards the Greeks: give them gold and watch them fight among themselves. 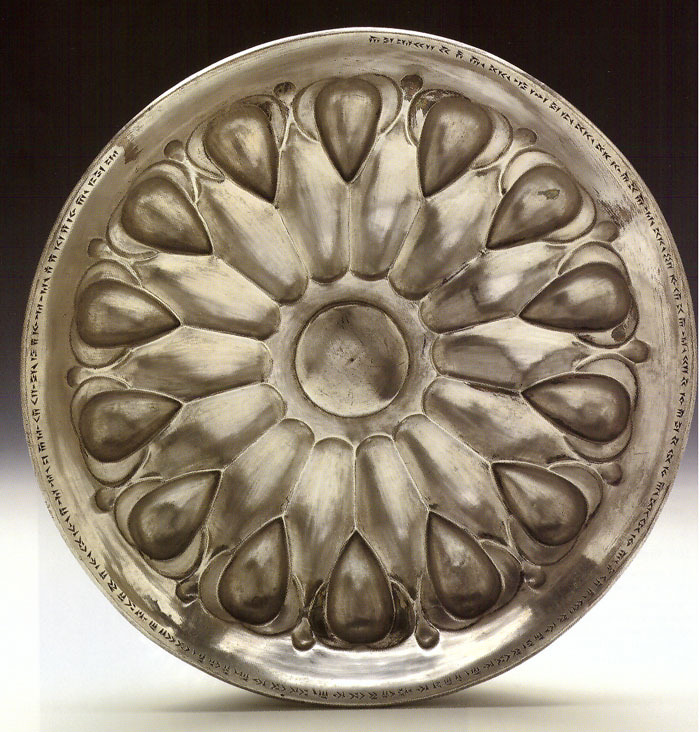 This is one of four very similar silver bowls: in the past doubt has been cast on their authenticity, but this one at least is now considered to be a genuine masterpiece from the Achaemenid period. [Article in Iran 1995 by J E Curtis]. Unfortunately its provenance is uncertain. Athenians were divided for political and military purposes into ten tribes, who each elected a general to lead them in wartime, or speak up for them in the people's assembly. This inscription goes on to list 177 individuals who died - presumably about one tenth of the casualties for the year (probably 459/8 BC). Most of the conflicts involve allies of Sparta. Was Artaxerxes' personal cup-bearer and advisor on matters of state. Artaxerxes sent him to Judaea to sort things out - a mark of the interest he took in this small part of his empire. The traditional view (compare the Greek view of Cambyses) was of a weak and decadent ruler. This was probably no coincidence. The Romans got many of their ideas on empire from the Persian empire. (For example roads, taxes, propaganda on coins). The "Roman mission statement" is from Virgil, Aeneid VI.